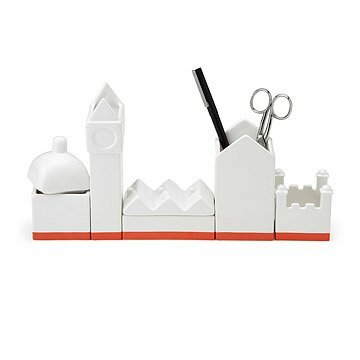 This porcelain organizer holds pencils, paperclips, and more in a charming, European-inspired cityscape. Enjoy a charming skyline view from your desk, no matter where your office is located. Individually, the components of this porcelain, modular organizer serve familiar functions--pencil cup, paperclip holder, etc.--but put them together and you've got a European-inspired cityscape, complete with clock tower, dome, and cozy row houses. It's like taking a tiny vacation each time you reach for a pen. Made in China.